The DBS is 50 years old this year having been set up by a few dedicated donkey owners to improve the profile of donkeys in this country. Our first president was Reggie Summerhayes one of this countries great horsemen and author of many equestrian books. It was originally called the Donkey Show Society, but it was felt too restrictive and was quickly changed to the Donkey Breed Society . Today the DBS is not just about showing and breeding but to help all donkeys in this country to have the opportunity of an active life. Donkeys are highly intelligent and contrary to popular belief they are not stubborn but like to think situations through. Hopefully you will enjoy our short display today. Probably a lot of you here today have had a donkey ride on the beach when you were young. Donkeys if treated quietly will react to children with love and care . It is great fun for them to have a ride . This is Isaac and his little rider Kit who is 5 years old His grand mother owns two donkeys who you will see a bit later on in the parade . Isaac is 17 years old and has worked extensively giving rides to children in London Hertfordshire and Essex as part of our farm diversification until retiring to Devon with us four years ago . He is still active and this year attended Exeter Cathedral for Palm Sunday. The DBS was originally aimed at showing and keeping a breed register similar to the horse and pony breeds. Jack is a 9 years old fully registered gelding coming from a long line of known donkey breeding. He is a prolific show winner. He also is broken to drive so he has beauty as well as brains. This is a very smart turnout with his handler Nick. Donkeys are not only suitable for children to ride and the larger Continental and American donkeys can be ridden by light weight adults. Tish and Lizzie enjoy gentle hacking around their farm near Looe .Tish is 17 years old and probably an eastern European donkey imported into this country via Ireland. Long reining , as you can see here, is used for training to ride and drive a donkey. Amos is progressing well with his training and will soon be ready to take his owners Sue and Andrew for a lovely enjoyable drive in the Devon countryside. He is 12 years old and came to Devon this year from Essex where he had been at the same home since he was 2 years old having been born at Old Macdonalds Farm Park next to the M25. His owners in Essex unfortunately no longer had time to do him justice and are very pleased he has now found a better role in life. Tonto who belongs to Carolyn is five years old and a companion to 3 horses and two sheep. As you can see donkeys come in all shapes and colours. This colour is called skewbald in the UK but in America he would be referred to as spotted. Donkeys mature slower than horses so Tonto has just started his long reining training ready for driving. Here we have Jacob who is 7 years old and has recently been broken to drive. He belongs to Tessa and both come from Falmouth. The cart even though it looks heavy is suitable for training Jacob as it is close to the ground and he is a bigger donkey standing 12.2hands. 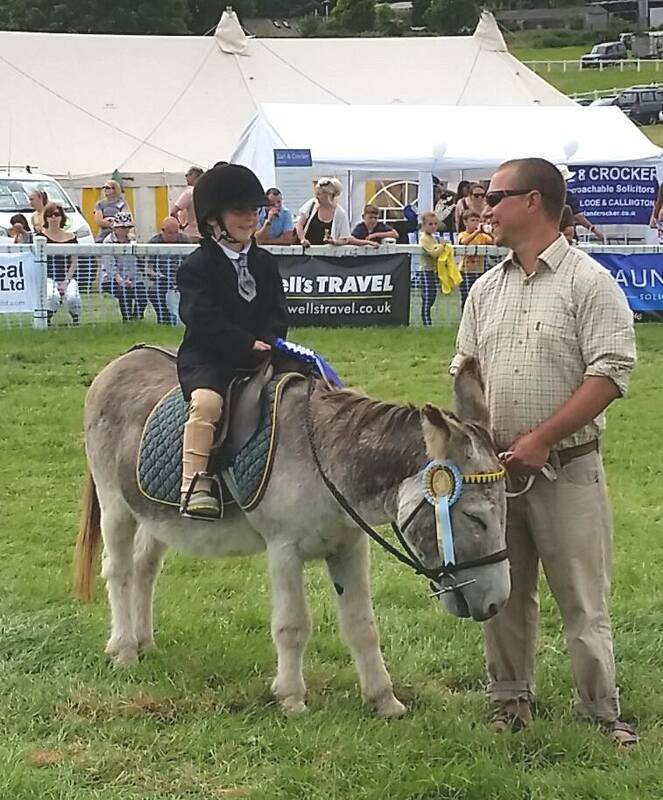 When Tessa purchased Jacob at 2 years old he had never been handled so was not very friendly but with patience he has turned into a lovely donkey. Joseph was purchased by Tessa at the same time as Jacob but he is two years older at 9. Today he demonstrates the use donkeys can be put to help carry the shopping etc by carrying a set of panniers on a pack saddle. A lot of donkeys are used for trekking especially in France but in the last few years it has become more popular in this country. One of my own donkey helps carry the produce home from the allotment in his panniers. You now see the results of a fully trained driving donkey. Arthur is 7 years old and at only 10 hands is well capable of pulling an adult in his trap. 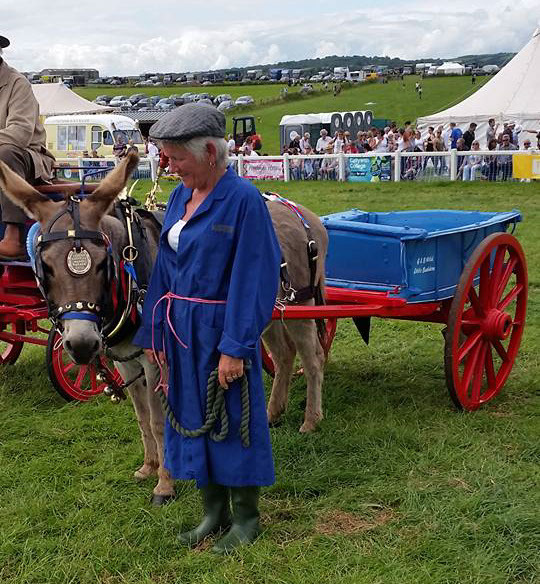 He is a lovely donkey to drive having been well trained with patience by his owner Heather. He is also shown in hand classes where he does very well. 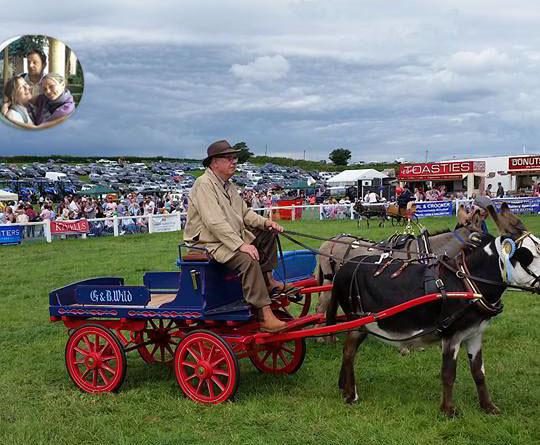 The cart and harness are well suited for driving a donkey and fit Arthur well . Next we go to traditional donkey carts. This is Patrick who is 13 years old pulling a London Trolley with a set of full collar harness. It is the original type used by donkeys and ponies for deliveries and by the rag and bone man in London. This cart is very old originally having iron shod tyres but we changed the over to rubber so it is not so noisy on the road. It has taken part in the London New Years Parade and the Pearlies kings and Queens Harvest Festival at the Guild Hall in London on many occasions . This is Cedric who is 23 pulling a Devon farm tip cart. This cart originates from the Fulford estate on Dartmoor and was probably used by a pony in the gardens or around the estate. This cart is not sprung and has iron shod wheels so not suitable to sit in but would be driven from the ground at a walk . As you can see Cedric is still fit at 23 and enjoying life . He has won first class awards at the London Harness Horse Parade with this cart as well as attending the London New Years Parade on numerous occasions with it. Long may he continue to live a happy and active life now in Devon. 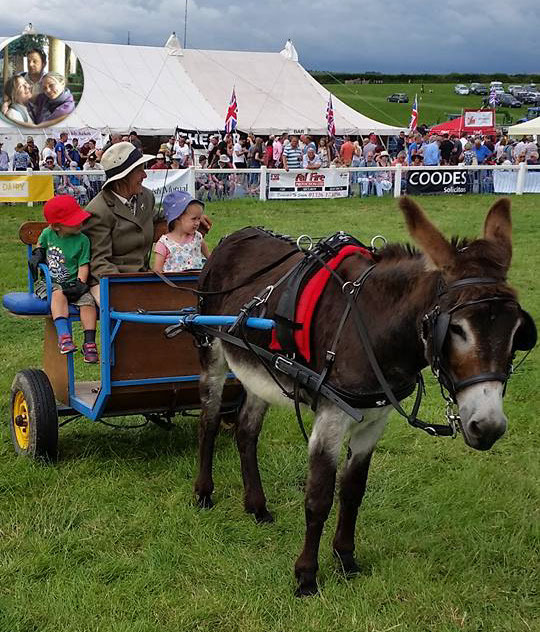 This concluded our demonstration of some of the things donkey can get up to so please do come and see us at the DBS South West Regional stand in the countryside area. 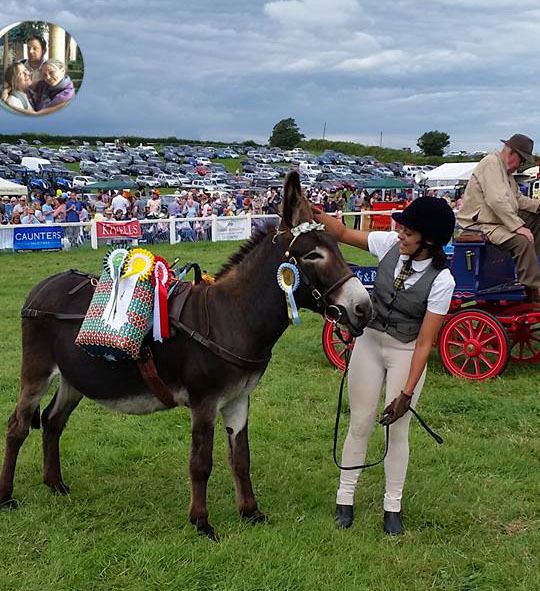 The DBS runs training and awards for both donkeys and their owners apart from organising show classes so all donkeys may join in. The Active Donkey Awards can all be done at home so no need to travel your donkey.